The holy Metropolitan Vladimir of Kiev was the first bishop to be tortured and slain by the Communists at the time of the Russian Revolution. Basil Nikephorovich Bogoyavlensky was born in the province of Tambov of pious parents on January 1, 1848. His father, a priest, was later murdered. The young Basil graduated from the Theological Academy in Kiev in 1874, and taught in the Tambov seminary for seven years before he was ordained to the holy priesthood. His wife died in 1886, and their only child died shortly thereafter. The bereaved widower entered the Kozlov monastery in Tambov and was given the name Vladimir. In 1888 he was consecrated bishop of Staraya Rus, and served as a vicar bishop of the Novgorod diocese. In 1891 he was assigned to the diocese of Samara. In those days people of his diocese suffered from a cholera epidemic and a crop failure. Bishop Vladimir devoted himself to caring for the sick and suffering, inspiring others to follow his example. In 1892 he became Archbishop of Kartalin and Kahetin, then in 1898 he was chosen as Metropolitan of Moscow and Kolomna. He served fifteen years in this position. Metropolitan Vladimir was distinguished by his compassion for the poor, and for widows and orphans. He also tried to help alcoholics and those who had abandoned the Church. The Metropolitan was also interested in the education of children in school, especially those who were studying in the theological schools. In 1912, after the death of Metropolitan Anthony, he was appointed Metropolitan of Petrograd, administering that diocese until 1915. Because he disapproved of Rasputin, Metropolitan Vladimir fell out of favor with the Tsar, and so he was transferred to Kiev. On November 5, 1917 he who announced that Saint Tikhon (April 7) had been elected as Patriarch of Moscow. The “Ukrainian Congress” was also calling for an autonomous Ukraine and for the creation of a Ukrainian Church independent from the Church of Russia. Metropolitan Vladimir suffered and grieved because of this question, warning that such a division in the Church would allow its enemies to be victorious. However, at the end of 1917, a Ukrainian Dominion was formed, and also a separate Ukrainian church administration (“rada”) led by the retired Archbishop Alexis Dorodnitzin. This uncanonical group forbade the commemoration of Patriarch Tikhon during church services, and demanded that Metropolitan Vladimir leave Kiev. In January 1918 the civil war came to Kiev, and the two forces vied for control of the city. Many churches and monasteries were damaged by the cannon fire. The Bolsheviks seized the Kiev Caves Lavra on January 23, and soldiers broke into the churches. Monks were taken out into the courtyard to be stripped and beaten. At six thirty on the night of January 25, five armed soldiers and a sailor came looking for Metropolitan Vladimir. The seventy-year-old hierarch was tortured and choked in his bedroom with the chain of his cross. The ruffians tortured the Metropolitan and demanded money. When they emerged, the Metropolitan’s cell attendant approached and asked for a blessing.The sailor pushed him aside and told him, “Enough bowing to these blood-drinkers. No more of it.” After blessing and kissing him, the Metropolitan said, “Good-bye, Philip.” Then he walked calmly with his executioners, just as if he were on his way to serve the Liturgy. After praying for a short time and asking forgiveness for his sins, Metropolitan Vladimir blessed the executioners, saying, “May God forgive you.” Then several rifle shots were heard. In the morning, some women came to the gates of the Lavra and told the monks where the Metropolitan’s body could be found. He was lying on his back, with bullet wounds near his right eye and by his right collarbone. There were also several cuts and gashes on the body, including a very deep chest wound. 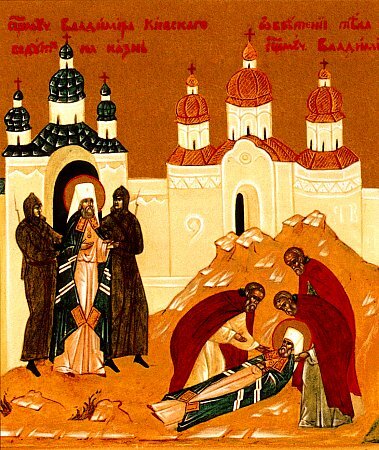 The hieromartyr was carried into the Lavra church of Saint Michael, where he had spent his last days at prayer. In Moscow, the All-Russian Church Council was in session when word came of Metropolitan Vladimir’s death. Patriarch Tikhon and his clergy performed a Memorial Service for the New Martyr Vladimir. A commission was formed to investigate the circumstances of Metropolitan Vladimir’s murder, but it was unable to carry out its duties because of the Revolution.The Council decided that January 25, the day of his death, would be set aside for the annual commemoration of all of Russia’s martyrs and confessors killed by the Soviets. The holy New Martyr Vladimir of Kiev was glorified by the Orthodox Church of Russia in 1992. On the Sunday closest to January 25 (the day of Metropolitan Vladimir’s martyrdom) we also observe the Synaxis of Russia’s New Martyrs and Confessors.